Summer is a time for travel, staying active and, of course, being outdoors. You need a special soap that can keep up with all your activities! Wouldn’t it be great if you could get the energy you need naturally without having to drink three cups of coffee in the morning or down a Red Bull? And wouldn’t it also be great if you could get a soap that not only delivered that energy naturally, but included other natural ingredients good for your skin and helping you have a fun shower? It’s now happening! 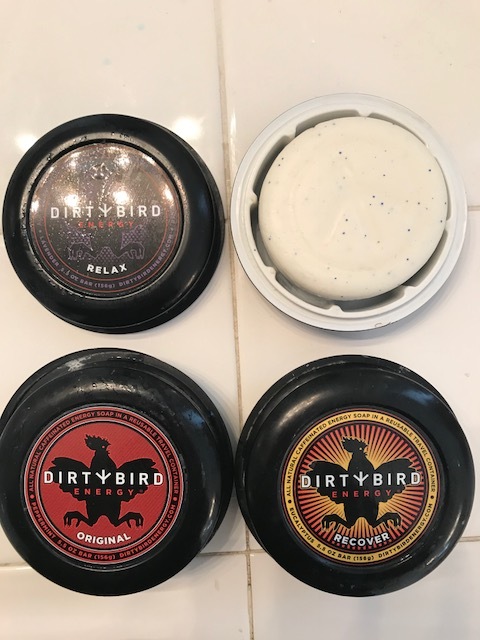 Introducing DIRTY BIRD soaps. Each DIRTY BIRD soap bar is infused with ingredients to help achieve this goal of feeling and smelling fresh and rejuvenated. The secret is, these energy soap bars are infused with caffeine and peppermint oil to energize the body and mind! Scientific studies show caffeine absorbs through pores and hair follicles, which will energize you even before your first cup of java in the morning. Moreover, caffeine has also been used for several years in day spas on the skin as an antioxidant to reduce the look of aging and cellulite. They just came out with their new Recover soap. It’s specially formulated with caffeine to help take on some of the recovery for like after you work out or had a grueling day at the office. It gently exfoliates away dirt and grime and leaves your skin soft. You’ll be entranced by the scent of rosemary, arnica and eucalyptus extracts. This trifecta of body treatments aims to encourage faster healing of bumps, bruises and inflammation so you can rest up and ready yourself for your next day at school or the big game or concert that you’re going to. Not a big caffeine fan? That’s okay because DIRTY BIRD also offers a Relax soap. These Relax soap bars are filled with lavender, chamomile, rosemary and ylang ylang essential oils. It smells wonderfully relaxing and I found myself eager to use it. It did not disappoint! Each of these oils absorbs to relax your body and mind as well as soothe your skin. An evening shower with Relax helps promote a restful slumber and allow you to awaken refreshed and ready for the day ahead. Another thing I love about DIRTY BIRD is their packaging. It’s perfect for traveling because each round soap bar comes packaged in its own reusable container that snaps shut and allows you to take your soap anywhere; the gym, camping or vacation. DIRTY BIRD is proudly made in the USA. For more details or to special order a monthly subscription or individual order, visit https://dirtybirdenergy.com.